Perfect as a starter or as a side dish for a dinner party. Heat the grill to high. Beat together the mayonnaise, butter and garlic cloves until smooth. Chop basil, stir through and season with salt and pepper. Put the halves of the ciabatta, sliced lengthways, on a baking tray and spread with the butter. 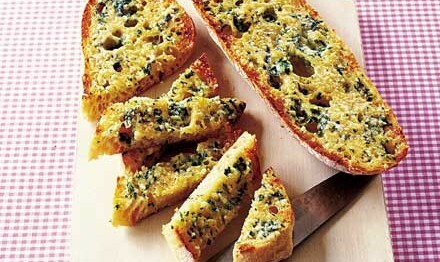 Sprinkle with grated Parmesan, then grill for 2-3 mins.